Think oats are forever stuck in breakfast land? We think these steel cut salad ideas will have you reconsidering! Cooking up the steel cut oats 'al dente' is the only real trick, and then it is up to your imagination to try whatever variation strikes your fancy. Combine all your ingredients together with the prepared steel cut oats. Ta daaa! This salad is nicest when it's chilled a bit, so let it sit in the fridge for at least half an hour (or up to a day) before serving. To prepare the oats, start with 2 cups of Steel Cut Naked Oats, and roast them in a frying pan on medium high heat for 5-6 minutes. Stir fairly often, particularly when the oats start to darken, or you'll be left with a panful of burnt oats...not so nice! You will start to hear the occasional popping noise, and that's a good indication that the oats are done. Roasting the oats this way really brings out their nutty flavour, and helps them to keep a firmer texture after they cook. While the oats are doing their thing, boil an equal proportion of water (2 cups) in a small pot. When the water has boiled and the oats are nicely roasted, combine them and let them sit for 1 minute. The oats should be somewhat soft, but they will still retain their shape and a bit of chewiness. Cover the oats with cold water to rinse them, and then drain with a fine sieve. Now comes the fun part – get creative with whatever veggies or salad additions you have on hand. Here’s one of our favourite fruit-y combinations to help liven up the winter. 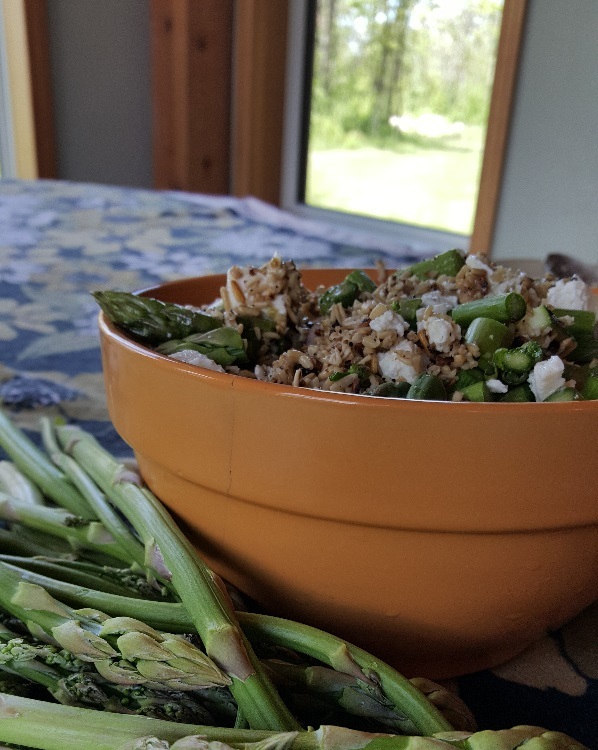 Some of our other favourite combinations are to go Tabouli style with heaps of parsley, tomatoes and cucumbers, or a simple balsamic dressing with asparagus, peppers, and feta (pictured below). 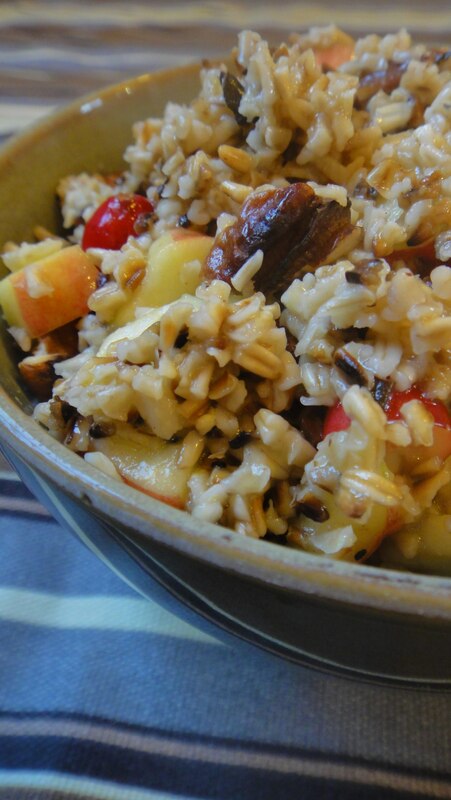 Combine all of the Apple Cranberry ingredients together with the prepared steel cut oats. Ta daaa! This salad is nicest when it's chilled a bit, so let it sit in the fridge for at least half an hour (or up to a day) before serving.